Energizing Formula Protects, Revives & Refreshes Tired Feet. 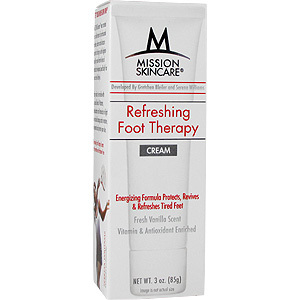 Our Refreshing Foot Therapy Cream softens and revitalizes tired feet. Enriched with our proprietary M-10 Complex - a powerful blend of 10 Vitamins and Antioxidants, plus 10 nourishing Botanicals - it's sure to soothe your soles. This refreshing foot cream with nourishing oils of sesame, sunflower and jojoba replenishes lost moisture as natural capiscum extract helps to soothe hot, tired feet. A powerful antioxidant blend of white, red and green tea extracts combined with goji berry, pomegranate and grapeseed extracts to help neutralize free radicals and protect skin from environmental toxins. Leaves feet hydrated, rejuvenated and revived. MISSION Skincare was created by an elite team of professional athletes, doctors and skincare experts to bring you the highest quality, most effective line of products developed specifically for your active lifestyle. Each product is enriced with a special blend of Vitamins, Antioxidants and Botanicals to fight free radical damage and to restore, rejuvenate and protect your skin. Apply liberally to feet, toes and ankles. For best results, apply before and after exercise. Refreshing Foot Therapy - 3 oz is shipped in a discrete, unmarked package. Orders are processed immediately and usually takes about 3 to 5 working days to be received. We do ask that you try it for 2 to 3 weeks to feel the full effects. Any information received is used only for order processing and shipping purposes. Your information, such as e-mail address, will never be disclosed to a third party.